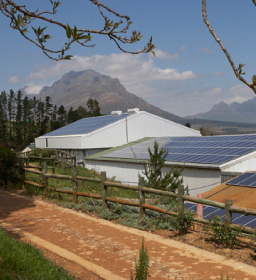 A 3 million Rand solar pv project now subsidises 30 per cent of Timberlea’s total electrical consumption. Usage is carefully controlled and monitored and methods such as timers in the cold rooms are allowing the farm to achieve a 1KWH reduction per kilogram packed year on year. Vehicles have been installed with a satellite tracking system contributing to a 6 per cent reduction in fuel usage and 13 per cent reduction in kilometres driven year on year. The use of electric golf carts also provides an environmentally friendly alternative to farm vehicles. All waste produced on our farm and in our pack house is recycled on and off-site. We have our own compost field where we turn paper, cardboard, waste fruit & wood chippings into compost for our trees. We manage to re-use 99,5% of our waste, and are continually looking to improve this figure. All rain water on the farm is channeled into catchment dams. 70 per cent of crops have soil moisture probes to inform irrigation strategy and all water used in the packhouse is metered. Future plans include replacing high water usage crops with more sustainable varieties as well as further increases in the use of soil probes.